Аннотация к книге "Ideas Unleashed"
The element of surprise, the unexpected, the shocking; these can be the most powerful tools in design for making an impact on an audience. This book is a collection of concepts and ideas that are extraordinarily unique; everything from unbelievably high budget campaigns to economically challenged ads. They will amuse, they will make you look twice, and they certainly will be remembered. Designers will find a bottomless font of inspiration in these pages. 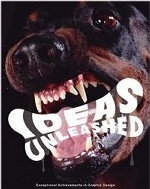 Ideas Unleashed is collected from around the world, not only from America, Europe, and Japan, but also from such places as South Africa, China, India, Indonesia, Malaysia, The Philippines, Peru, Chili, Guatemala, and Argentina - countries whose ads are rarely seen in the western world. It is interesting to see how different countries and cultures utilize such different design styles yet still have one thing in common - humor and wit. An outdoor Mini Cooper-shaped poster pasted right on the exit of a subway station stairs looks as if all the people walking into the station were getting in the car. A flyer, which looks exactly like a paper napkin with a lipstick-stained kiss is an instant attention-getter for a restaurant. No matter how far design technology has advanced and design skills vary, an effective design still originates from a human idea. This book shows readers this most important element in design. The contents are classified by item: outdoor and in-door campaigns, posters, catalogs, product packages, direct mailings, flyers, and more.